As I’ve climbed and shared more about the experiences, others have asked to come along. Often these requests aren’t for anywhere particular, more of a budding interest and willingness to follow along any local trail. However, a friend I’ve gotten to know through work had a specific request. This request came from Dan F. in the winter/spring, and he said that he was particularly interested in Mount St. Helens. 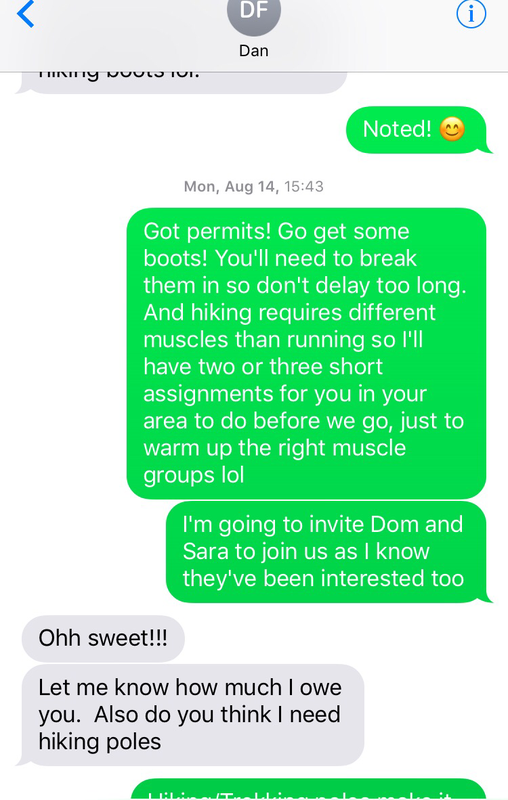 After explaining the permit process to him and how it was no guarantee that we could go in the summer, I told him I’d try to get something worked out and that he should start training on local trails. Fast forward several months. On the purmit.com site where permit holders for St. Helens sell/trade their extra permits, I found a seller for a weekend-day in September. Before this exchange, I had given Dan the info on what to expect, what gear he needed, how to prepare, etc. Once the permits were secured, it was up to him and the others invited to join our crew to be ready for the climb on September 2nd. Our party ended up being me, Dan, Sara T. and her boyfriend, Dom W. All of us were connected through work (same agency, different offices) and the three of them shared the common goal of making it up Mount St. Helens. I told them I’d be happy to help lead them as best I could, the rest was up to them. Our schedules resulted in a somewhat later start, departing the trailhead at around 9:15 am. Not ideal, but still feasible with an estimated window of 6-9 hours roundtrip based on trip reports and beta from other hikers. I set our turn around time as 3pm, knowing that if it took much longer we would risk coming down in the dark. Overall I knew the crew was inexperienced but also in good shape, so I wasn’t worried. 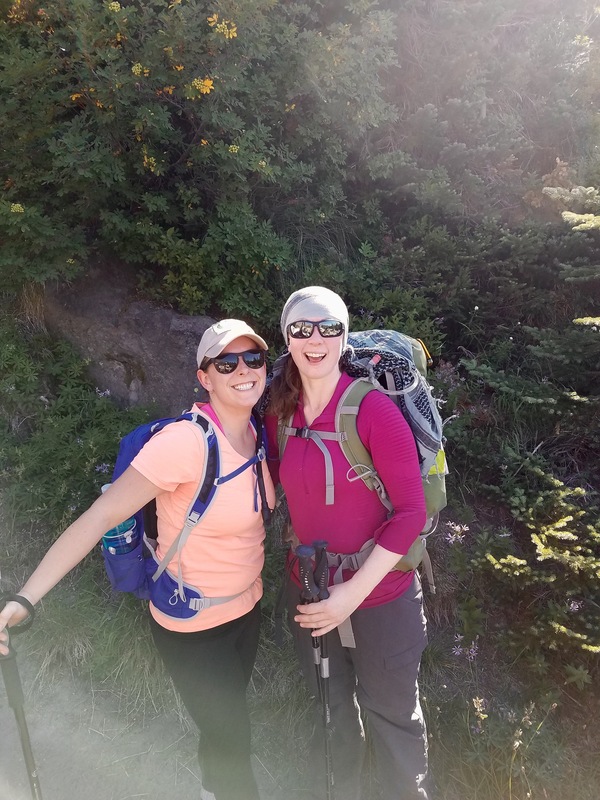 In high spirits, we attached our permits to our packs and started up the mountain. As we pushed through the first miles of forest, I began to feel some sense of the challenges ahead. The day was already proving to be hot, all four of us glistening as we hiked through the shady forest around the base of the mountain. 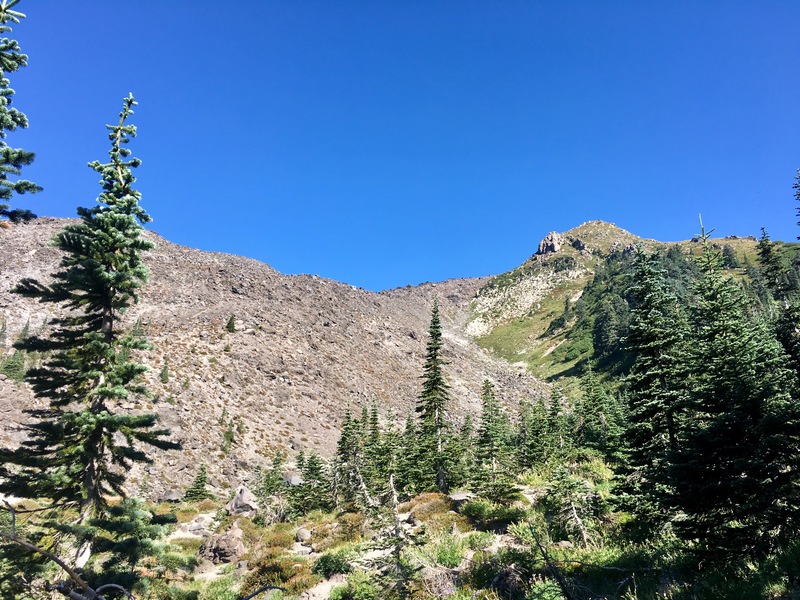 As we approached the tree line where we would set out onto the volcanic landscape, I felt the heat even more and made sure everyone had sunblock and water. No more shade after this! The climb that day was one of the most difficult climbs I’ve done to-date. The distant views of Mt. Adams kept me going, as did the words of encouragement I kept saying to my friends as we sweated and struggled to push ourselves on in the heat. We ran into climbing rangers at one point and I got the impression they wanted us to turn around, one saying the temperatures were probably in the 80s and that there was no shade and it would just get hotter. The crew knew my rules about speaking up if things felt wrong but also following the rule of fives if it was just difficult but not illness or fatigue telling them to stop. We conferred and decided to keep going. Dom tended to push ahead and take longer breaks to wait for us while Dan, Sara and I kept a slow and steady pace with numerous water and rest stops. It was grueling. As each of us reached a point of wanting to quit, we all encouraged each other to go a little further. 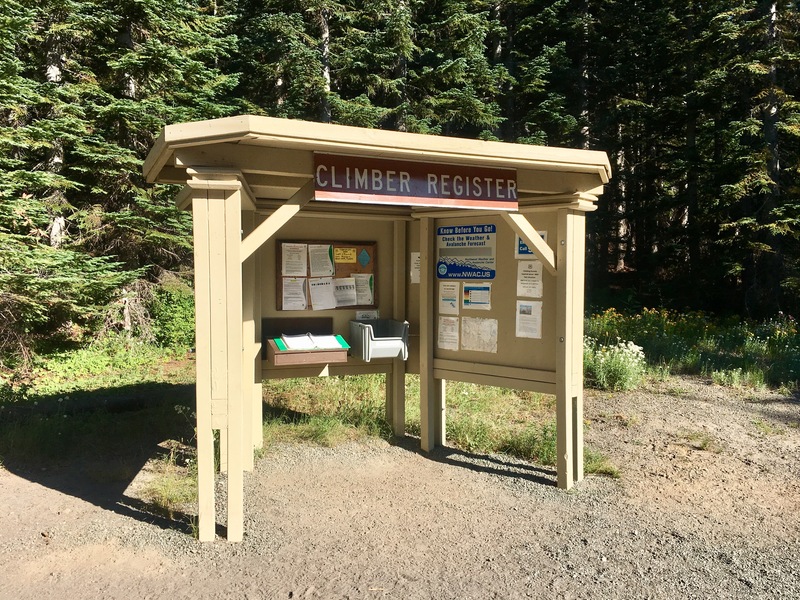 I set a group goal of making the monitor station, located above the boulder climb and preceding the infamous 1000′ of gain up the ash-dune that led to the top. And so, pausing whenever the rocks provided shade and often where there was none, we prevailed and made it to our pre-Summit destination where we would check the time and reassess our situation. The mental games we go through on climbs, especially ones where the elements are not aligned in our favor, can be amazing. I felt miserable but kept speaking as positively as I could, more outloud to myself than to anyone in particular. My fellow climbers were encouraged, upset, angry, and more determined each in their turn. Yet as we paused to eat lunch and decide on what would happen now, somehow each one of them looked inside and found the courage and strength to push on for the summit. I was surprised, having thought that by this point at least one of them would want to turn back. But there you have it–once again, the strength of the human spirit prevails. It was after 2pm and close to my turnaround time, far later than I imagined it would be, but I agreed that we could push on if we moved with intention and kept breaks to a minimum and as short as possible. Dom found his struggles motivated him and pushed up to the summit ahead of us, able to keep us in view across the barren mountainside. Sara, Dan, and I pushed on, one step at a time, each fighting an inner struggle to ask more of the body than has ever been asked before. When we stood/collapsed/embraced/stumbled at the top, we were at the turnaround time, tired, dehydrated, and ecstatic. I loved watching the reactions of the three as they stood on their first volcano and realized the magnitude of their accomplishment. I gave myself a small pat on the back too as I looked over at the ever present Mt. Adams and remembered my own struggles to reach her summit, and acknowledged how much harder this climb in the heat had been than anything else I had done so far. After victory snacks and pictures, it was time to head down. A quick lesson in glissades helped the others get down a small snowpatch in less time, and we raced the setting sun as we hurried down the rocks back to the tree line. I began to feel the effects of electrolyte imbalance and not hydrating enough, even though we all had water left and had been drinking all day (the heat won out in the end) and made the hard decision to push ahead of my friends in order to get off the rocks in case I ended up being in real trouble. I kept them in line of sight the whole way as I raced down the last rocky slope and gratefully rested at the edge of the trees. Even through my exhausted, pain addled state, I was able to watch with pride as they navigated down to where I was, making their own decisions and working together as a team. I may have lent some knowledge and experience to the climb, but I saw with pride how capable and able to lead each of them is. What an amazing gift! Checking on everyone’s gear and distributing headlamps “just in case,” I encouraged Sara and Dom to set off ahead and Dan and I brought up the rear. Those headlamps proved invaluable as the final mile or two once again proved to stretch on for an eternity and the woods went from dusk to darkness as we plunged down the trail in search of the trailhead. Beautiful views at sunset kept my spirits high those last miles, and Dan and I stopped often to sample the luscious wild blueberries before the darkness hid them from view. By the time we got to the car, it was a race down the road to get enough cell range to let our emergency contact know that we were alright, a message that was finally pushed through barely 30 minutes before our prearranged “call out the cavalry” time. Car to car took us about 11 hours, longer than I had ever anticipated (my first trip up St. Helens the previous year in colder conditions with fewer stops was about 7 hours roundtrip, for comparison). Never underestimate the effects of heat! We limped back into Tacoma where we had carpooled from and I barely made it to a friend’s apartment where I gratefully accepted a shower and a couch to sleep on as there was nothing left in my reserves to make it back to Vashon that night. Once my phone lit up with confirmation that everyone was home safely, I was able to relax and share the stories from the day. 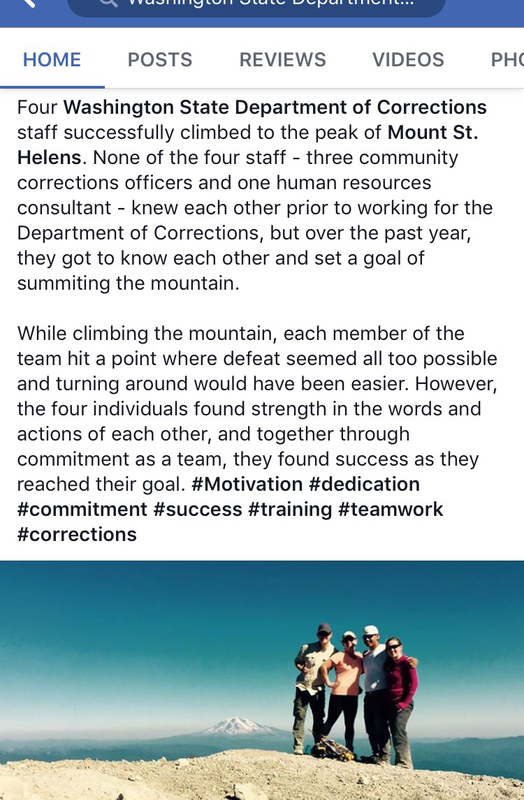 Afterwards, I shared our story with a few people at work, and soon it was suggested that I submit our climb to the communications folks as a great story about teamwork. Well, why not? Sure enough, a week or two later, I was called and asked a few questions, and then a small story appeared in between other agency news pieces. Once again, I reflected on how proud I was of my friends and their ability to reach a dream. Never stop climbing.